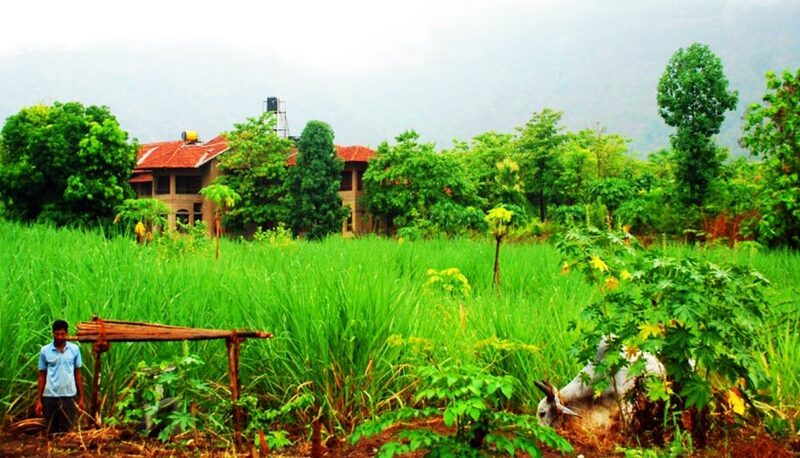 Govardhan Eco Village (GEV) boasts a vibrant community of over 160 members, which includes about 25 families, 60 resident monks and 50 students. Community living forms the most vital aspect of GEV, teaching the importance of sharing as a means of conserving natural resources. At GEV the community is cantered around leading a natural lifestyle based on the cardinal principles of Vedas. A real eco-friendly lifestyle begins when we harmonize our lives with the divine cosmic laws and learn to abstain from activities that are detrimental for development of a peaceful environment within. By our individual commitment to nurture a divine ecology of the heart, we can come together as a community to protect the environment. A beautiful temple is located within the GEV campus, which forms the center of the community, and it is the mood of service to one another that forms the impetus for the entire communities’ activities. All of the residents (except the students) are engaged in various activities at the farm such as organic farming, cottage industries, cow care, teaching and rural developmental activities. As the rural outreach programs in over a dozen nearby villages continue to expand, the number of people visiting the temple is steadily increasing. Work is already in progress to make a new temple complex, with a capacity for accommodating over 1000 people, built completely by sustainable material and eco-friendly technology. Organic farming, cow protection, education, rural development, alternative energy and natural building are some of the activities of GEV. With a vision to share with one and all, this truly fulfilling experience of sustainable community living and to educate people in the field of traditional sciences including yoga, ayurveda, cow protection and spirituality. The Govardhan Ashram has been setup with a luxurious guesthouse facility, auditorium, seminar hall, conference rooms, yogashala, ayurvedic wellness center, swimming pool, boating pond, adventure sports, nursery and many other exciting features. Community development in rural areas is one of the prime focal points for GEV. GEV has been supporting a project “A Holistic Development Program for Rural and Tribal communities in Wada Block of Thane District” since its inception in April 2009. This project is being organized by Maharashtra Institute of Technology Transfer for Rural Areas (MITTRA), a development organization promoted by BAIF. The aim of the project is to benefit 500 tribal families over period of 5 years. The project activities started with 7 tribal villages located around GEV in Galtare in Wada block of Thane District. The villages Ghore, Ghuir, Galtre, Hamrapur, Nane and Sange are proposed under this innovative project. The overall objective of the program is to improve the standard and quality of living of the poor tribal families through a holistic and enabling program approach. This can be achieved by helping the tribal families to develop productive assets to enable them to earn substantial and sustainable livelihood over a long period. They include ‘Wadi’ (integrated farming system comprising of horticulture, agriculture and dairy) and other non-farm enterprises. There is also a need to tackle the root causes of poor health and improve the quality of living, particularly of women who often suffer due to the austere living conditions. The project activities begin with conducting meetings that are aimed at understanding the views of the families and their status in agriculture. This is followed by exposure visits to some developed villages by the tribal. This helps the families of the village to get firsthand experience of seeing the developmental activities benefited by tribal families and share their experiences with the farmers of developed villages. The exposure visits are very productive and act as a great source of inspiration for many families. Govardhan Ashram can be a great fun filled place to learn. With a plethora of activities and massive scope for learning, Govardhan Ashram is an ideal location for field and educational trips. Keeping in mind schools and other student groups who are looking for a fun-filled learning experience, Govardhan Ashram offers specially designed retreat packages for its young visitors. You can have your own retreats at Govardhan Ashram or you can be a part of the retreats organized by Govardhan Ashram. GEV demonstrates various practical ways of achieving a sustainable lifestyle. Be it food, energy or even shelter, there are ways of meeting all humankind’s requirements without creating a major impact on the fragile balance of the planet. GEV also facilitates education and training in various fields like organic farming, natural buildings, alternative energy and lifestyle management. Visit our courses page for more details. In case you wish to bring the members of your institution or school for knowing more about the various eco-practices at Govardhan Eco Village please email us on ashram@pamho.net. For more information about each of these areas you can also get in touch with the experts who helped us in our endeavours. The essence of all spirituality is to just become an instrument of compassion to serve others. Extending the spirit of servitude to various levels, the Govardhan Ashram has taken up many projects from social development to animal protection, providing solace and shelter for the troubled souls by putting into action the divine teachings and philosophy of the scriptures. With a view to improve the standard and quality of living of tribal families through a holistic and enabling program approach, the ‘Wadi’ program is successfully providing opportunities for sustainable economic growth. By implementing an integrated farming system comprising of horticulture, agriculture and dairy/other non-farm enterprises, this program enables the families to earn for themselves and improve livelihood as well as quality of life over the long-term. The Vedic culture protected women as the most precious part of the society. Women, in their role as mothers, take up the major responsibility of imparting the right values in children. The mother is the first teacher and hence the entire value system of the society at large becomes dependent on women. Drawing inspiration from this Vedic model, special women empowerment programs are being run which facilitate formation of self help groups and cottage industries, thus empowering them for a better future. Why restrict our vision of compassion to mere humanitarianism? By supporting the activities of the GEV Goshala in setting up world class cow care facilities and conducting regular awareness programs explaining the multifarious utility of the cows, active cow protection campaigns are flourishing. Creating opportunities for a happy future for scores of rural kids, the Govardhan Ashram supports the Lady Northcote Hindu Orphanage (LNHO), which caters to the educational needs of many under privileged rural children. There are also regular value education programs conducted in various schools near the Govardhan Ashram. Swirled in the mystic mountains of time, and nestled in the lap of historical Kohoj Fort, Govardhan Ashram today boasts of world class facilities in complete harmony with nature and ecology. The Ashram provides the ultimate escape from mundane to spiritual through eco-friendly cottages, an ayurvedic spa, yoga studio, a Vedic temple and amenities center. A nursery and an herbal park add to the symphony by helping to restore and rejuvenate our primal energies with rare medicinal and forest herbs. The residential facilities include private and communal cottages made from eco-friendly materials like earth and fiber to invoke a serene and peaceful ambiance. Also being an ideal destination for Board Meetings and Executive Retreats the Ashram has an impressive amenities building with seminar rooms and a conference hall with a majestic mountain view of Kohoj Fort to create inspiring venues for high-powered meetings. This is truly a venue like no other.